Welcome to Lake Magdalene United Methodist Church! Thank you for taking the time to learn more about our faith community. Our church is centered in our mission to make, grow, and equip disciples of Jesus Christ for the transformation of our neighborhoods and the world. Visiting a church can be a bit overwhelming when you don't know what to expect. At Lake Magdalene UMC, the first thing you should expect is to be warmly welcomed no matter who you are. We love visitors and want you to feel right at home. We hope the information below is helpful as you plan your visit. We look forward to meeting you! *We recommend arriving a few minutes early to allow for parking and finding a place to sit. All services are not identical. Read below for more information on each of our three services. Learn more at our Worship page. Our 9:30 AM and 11:00 AM traditional services follows a spirited traditional pattern. Our Chancel Choir performs a wide variety of anthems and leads the congregation in singing traditional hymns and choruses. At the 9:30 AM service, there is an always enlightening and adorable "Children's Moment" suitable for elementary aged kids. These services take place in the Sanctuary. Our 11:00 AM Genesis Contemporary service where you can worship in a contemporary atmosphere with upbeat worship music, hear God’s word, a relevant message for today, and ultimately experience life change through a relationship with Jesus Christ. This service takes place in Heritage Hall. How do I get to Lake Magdalene UMC? We are located approximately two lights east of the intersection of Fletcher Avenue and Dale Mabry Highway. Dress comfortably. You'll find a variety of wardrobe styles any given Sunday from jeans and t-shirts to ties and sport coats. We don't care how you dress...we're just glad to see you! Do you offer Sunday School classes? There are a number of Sunday School classes for adults, youth, and children. Learn more about times and classes by clicking on the links below. We provide nursery care for all worship services. This includes Wednesday evenings, Ash Wednesday, Maundy Thursday, Easter Worship, Christmas Eve (exuding the 11 PM service) and all three Sunday morning services. There are several handicap parking spaces in the West parking lot. Enter the sanctuary through the West doors or continue up the ramp and through the front doors. The elevator is located in the Christian Education Center (CEC) for access to all classrooms. If you need help on Sunday morning, one of our friendly greeters and ushers would be glad to assist you. We also have a Guest Services desk in the Narthex available during and after all services to assist you with any questions you may have. 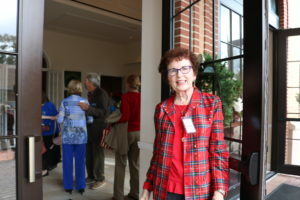 If you would like to talk to someone prior to visiting, please email Cyndie Petrus, Coordinator of Hospitality, Connection and Care, at cpetrus@lmumc.org.